As I've gotten older I've taken more and more interest in what I eat and exactly where it comes from. Truth be told, you don't know for sure how something was grown unless you grew it yourself. 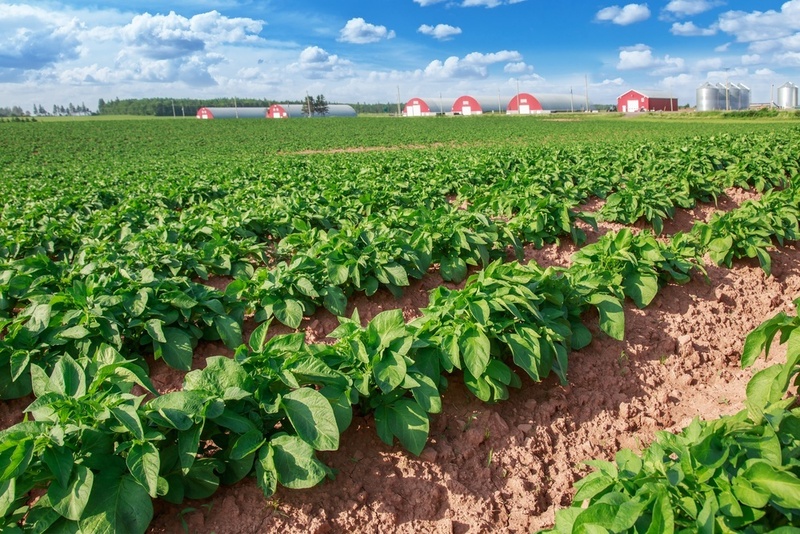 Potatoes are an excellent crop to grow. They're sturdy, you can cook a wide variety of meals with them, and even beginners can have some degree of success with them. They were the first plant I tried to grow but I had plenty of problems due to my inexperience. If you're in the same boat as I was, or you're just interested in horticulture, this guide on how far apart to plant potatoes should be quite informative! Too many plants in one space mean that they're competing with each other for nutrients. If the nutrients are used up too quickly then the plants can grow poorly. A worst case scenario would be a plant failing to fruit at all. If a plant is flowering poorly, you might still be able to see healthy foliage but the end result won't be very good. Along with nutrients, soil only has so much moisture per square foot to give out. You could water the area more often but then another problem occurs. Densely packed plants will be drenched in water as well as prevent some water getting into the soil. You might think soaked plants are a good thing but then they become more susceptible to disease. The fact that the potatoes roots aren't getting enough moisture will also compound the problem. Plants need air just like people do. Fill a room full of people all squeezed together and they'll soon complain that they're not able to breathe properly! If you're trying to squeeze as many as you can into one plot, potato plants will be feeling the pinch too. 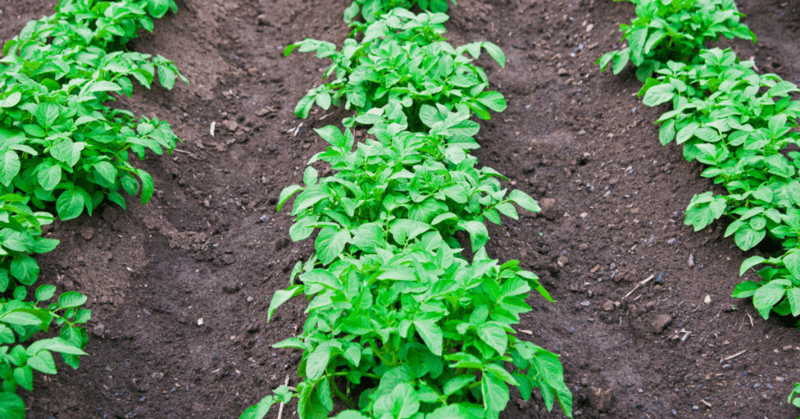 What's the Recommended Spacing Between Potato Plants? It can be easy to underestimate just how much space potato plants need. Potatoes increase a lot in size as they grow and their roots also need space to enlarge. 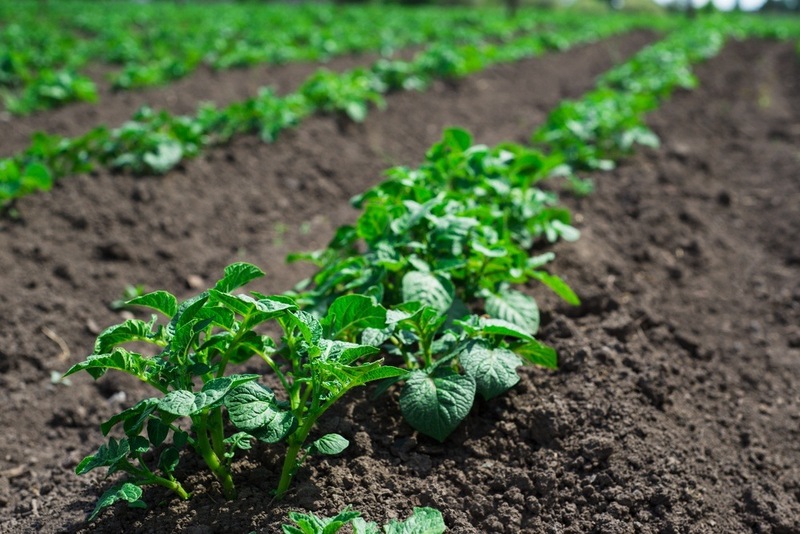 From every available source, leaving between 9-12” (1ft) between each potato plant is the recommended spacing. Don't forget about the rows, though. The rows require around 30-60” (2-3ft) between themselves. This is the optimum distance for cultivating, weeding, fertilizer and harvesting. These planting distance recommendations are based on the various stages that a potato plant goes through before it reaches maturity. This article will give you more in depth information about those stages, including a wealth of other information. Make sure there's proper drainage if you're using a container. Raising the container and evenly spaced holes is the best way. The bottom layer in your container will need about 5-6” of compost and soil. Adding sulfur can also help protect against bugs and rot. Make sure your plants are 9-12” apart, with your rows having 30-60” apart. The eye(s) of the plant should be facing upwards, as that's where the potato sprouts from. Add more soil to the container. Usually, around 2-3 inches will be sufficient. For a visual step by step guide on preparing and planting potatoes, this YouTube video makes for great viewing! If you're buying potatoes from gardening stores, they should come with very useful tickets that tell you exactly how far to space them apart. With hundreds of different potato varieties, this is the surest way to get a hefty crop. Potatoes are an excellent crop to grow and from just 4lbs of seed potatoes, you can get a return of 100lbs, as long as you're looking after them. I found an excellent in depth guide that's free to download if you're looking for more information. 'A Guide to Growing Potatoes in your Home Garden' covers everything from soil fertility, optimal temperatures and exactly why potatoes are good for you in the first place. You May Also Like: How Far Apart to Plant Tomatoes for Better Growth? It's generally agreed that potato plants should be spaced between 9” and 12” apart. If you're using rows too, they should be around 30” to 60” apart. This will allow your potatoes enough room to get all the water, nutrients and air they need to give you a great harvest. If you have any tips of your own to share, or you'd like to give your own opinion, please leave a comment below.